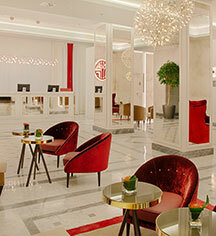 NH Collection Roma Palazzo Cinquecento is an elegant five-star hotel in the heart of the Italian capital. The hotel sits overlooking an idyllic garden, and in front of this garden is a section of the Servian Wall which was constructed to protect “The Eternal City” in the 6th century B.C. This historic building was originally a post office in the early 1900s, and subsequently used as the offices of Ferrovie dello Stato, the Italian Railway Administration. 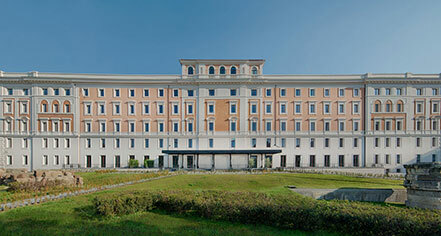 The hotel’s architecture is a splendid example of 20th century Italian architecture, rich in Liberty style details. The hotel's 177 luxurious guestrooms and suites are cozy and will provide a restful night sleep after a day of exploring Rome. Guests can enjoy a refreshing drink with 360-degree views of Rome’s famous skyline from the rooftop terrace, work out in the well-equipped fitness room, or visit the tranquil garden where they can still see the ruins of a defensive wall built by the Romans. The hotel is conveniently located in the middle of Piazza dei Cinquecento, providing easy access to the paramount monuments of the Eternal City. Within an easy 15 to 20 minute walk, tourists will find the Colosseum, one of the world's most famous and recognized masterpieces in the world. The NH Collection Roma Palazzo Cinquecento's closeness to the train station allows guests to travel with comfort and move easily around Rome while visiting. The Leonardo Express train takes only 32 minutes from Leonardo da Vinci–Fiumicino Airport and the two underground lines have stops in every important cultural attraction in Rome. NH Collection Roma Palazzo Cinquecento, a member of Historic Hotels Worldwide since 2017, dates back to 1900. The hotel building was previously a railway station; underground in the cellars, there are hidden train platforms. Cancellation Policy: Cancellation policy varies depending on the rate, room, or package booked. Parking: 25,00 euros per day. Payment: Credit cards and cash are accepted. Pet Policy: Max. height: 40 cm. 20 Euros per night. Smoking Policy: Smoking room available upon request. Learn more about the History of NH Collection Roma Palazzo Cinquecento .